With today’s Instagram mentality of "bigger is better" and "more bacon = more followers," it’s hard to find a simple, cheap burger these days. But some folks still stay true to the classics, with old-fashioned, juicy burgers at an honest price that you can feel good about because 1) you’re spending wisely and 2) you’re eating a burger, and that always feels good. 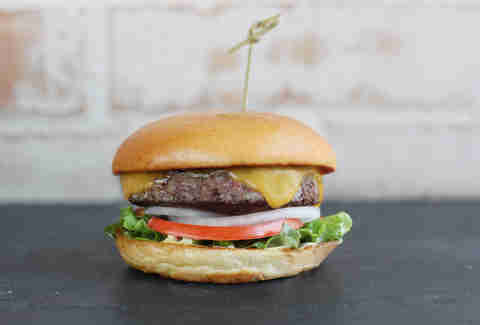 We’ve scoured the lands for exactly that, and because Houston's burger options are so bountiful, and found a whopping 15 that fit the very cheap, $8-and-under bill. People love this light blue burger shack on the eastside of Downtown for a reason, and that reason is old-school nostalgia. The thick, 1/2lb hunks of fresh ground beef are hit simply with salt and pepper, then pressed onto the griddle and cooked to a juicy medium-well before being delivered straight to your gut. Tack on tots for $2 bucks. With an emphasis on using humanely raised, all-natural beef and local ingredients, this burger stop pays a lot of attention to its product. 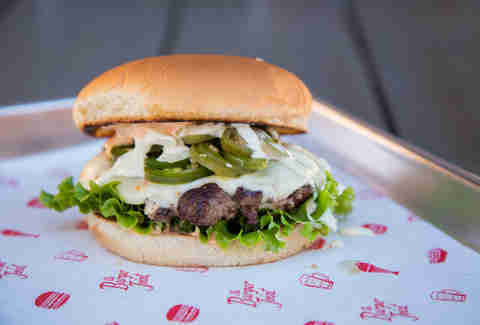 Which can only mean you don’t have to pay any attention AT ALL when building your very own Jerry Built burger. To keep costs low, go with the house cheeseburger, grilled over an open flame and topped with American cheese, griddled onions, and Ernie’s sauce (a blend of mayo, ketchup, and relish); or up the ante by going for the bacon avocado burger for another 50 cents. 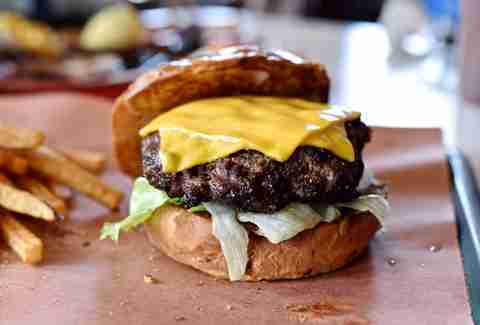 Smashed 10oz all-natural chuck and brisket patties are cooked to a just-pink center (unless you request otherwise) at this burger joint, the latest hit the king of all things beef, Chef Ronnie Killen. The flawlessly seasoned, aggressively seared burgers don’t need much more than American cheese, crisp lettuce, dill pickles, and off-the-vine tomatoes. What they do need, however, is a side of JJ Watt-approved fried cheese curds and impeccable house-cut fries. This retro institution has been serving Houstonians since 1961, when it started as a grocery store. Today, you’ll find loosely formed and properly crusted 1/2lb burgers sizzling alongside artery-clogging accouterments like deep-fried bacon, twice-fried onion rings, and house-fried pickles. But if you want to make it to your next birthday, you’ll do just as well going with the classic, served juicy and well-seasoned on a pillowy sesame bun. Face it: We can’t talk cheap burgers without mentioning this long-running roadside burger stand. Expect absolutely zero frills here, with a single meat patty with cheese starting at just $2.86, and additions like pickled jalapeños and bacon bringing you up to a steep $3.83. But it’s not just the price that is attractive, the stalwart is open 24/7 (even on Christmas). Just don’t forget your cash. Despite its location inside a Greenway Plaza food court, it didn’t take this NKOTB long to gain a loyal following. The umami-forward flavor of the burgers (thanks to a special soy-shiitake-slather) probably has something to do with that. The whole lineup starts at $7, so choose whichever burger suits your tastes best. But if you like heat, going SPICY!!! is an easy decision. Three kinds of jalapeño, house sambal mayo, pepper jack cheese, and soy-marinated serrano chilis make the burger truly special. True story: Our burger expert, the venerable Kevin Alexander, is flying around the country eating burgers for an entire year (good luck with that, KA). 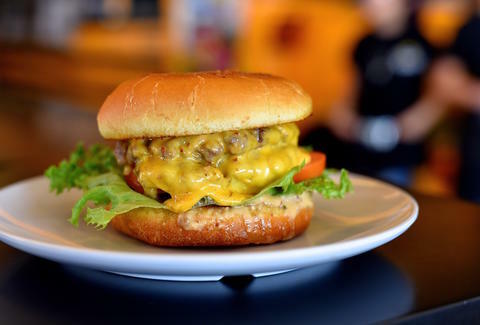 He started in Houston, and this long-running bayside burger institution’s perfectly thin and peppery crusted smashed patties took the top spot not only in this city, but in his entire journey thus far. 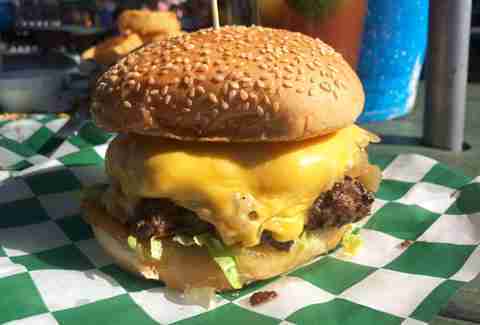 Follow Kevin’s #ThrillistBurgerQuest to see why. The second cheapest burger on our list comes with a duo of spicy 2oz patties that sit pretty on a buttered and toasted bun. Think of it like a quarter pounder, but with actually good beef that gets freshly ground with garlic, jalapeños, onions, and spices ground directly into the meat. At this price, you can afford to add some fresh-cut chili, cheese fries, too. It’s hard to pick a burger at this old-timey, cash-only haunt. But when hot shoestring fries are stacked right on so you don’t have to spend the extra money for a side, the decision is practically made for you. The Cuban mixes a burger with a Miami’s favorite sandwich, stacking on Swiss cheese and ham, red onions, and sweet and spicy Cuban sauce, too. Hope you weren’t traumatized by bus rides as a kid, because some of Houston's finest burgers come straight out of this big yellow school bus. 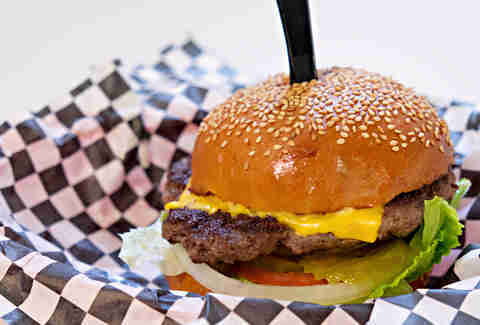 The gourmet burgers have a seriously beefy flavor thanks to a house-ground blend of three cuts of Black Angus. They can be accompanied by everything from tipsy onions and bacon to grilled cheese buns, but if you’re trying to lighten the hit to your paycheck, go for the thin, double patty Class Clown, made simply with American, lettuce, tomato, and house-made burger sauce on a freshly baked potato bun. Throw in a chocolate malt milkshake and you've pretty much got the best school lunch ever. 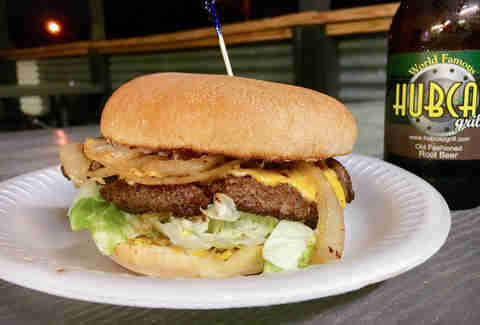 With a Portuguese bread-like bed for its massive burgers, Hubcap just may rock the best bun in town. But it’s the stuff between the bread that draws fans near and far. The 1/3lb patties are good enough to be left alone, with a soy, umami flavor that our burger expert deemed “absolutely fantastic.” Purists will love them topped with just cheese and grilled onions, and those looking for a little more oomph can get wackiness in the form of a Frito Pie Burger, Muffaletta Burger, and peanut butter and bacon-topped Sticky Burger for under $8, too. We have to give it up to Austin because this big and beefy import is legitimately delicious. The burger bar offers a wide variety of burger choices made with locally sourced ingredients and from-scratch buns, but its Classic version needs nothing but Angus beef, LTO, and “sassy sauce” (the addicting house sauce made with horseradish, honey mustard, and mayo) to shine. 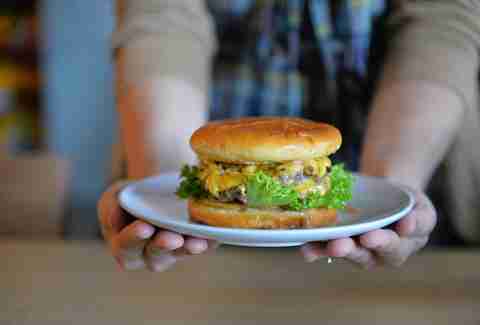 Get it alongside burger’s favorite companion: beer. This enlightened burger isn’t light at all. With 6oz of grass-fed Texas Akaushi dripping its beef juice onto a buttery challah bun alongside grilled red onion, jalapeño, smoked bacon, and a scorching house-made habanero sauce, you may need a nap after this one. Especially since you’re getting a crushed Oreos and Nutella crepe for dessert, right? 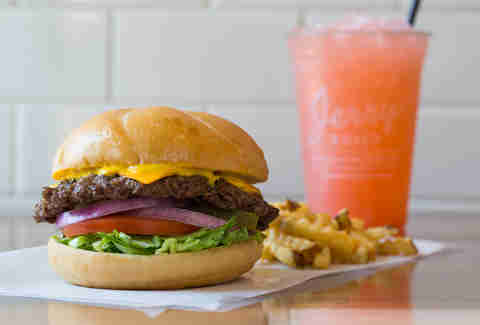 Sometimes, all you need is perfectly griddled Angus beef, lettuce, onions, and cheese on a high-quality bun. Other times, you turn that regular cheese into pepper jack and add on serrano peppers, jalapeños, chipotle mayo, and fire sauce. This is one of those times. To combat all of that heat, you may want to also order an 8th Wonder Rocket Fuel beer float. Just sayin’. We like all the locally sourced, fresh-formed, and sloppy-as-all-hell burgers at this cult favorite burger resort, but some will run you a bit over $8. The Cooter Jack, however, is not one of them. The monster burger hits every topping checkpoint, with buttermilk fried onion strings for crunch, smokey BBQ sauce for sweetness, chipotle mayo for richness and heat, and gooey Jack cheese... for cheese. Get it on a jalapeño cheddar bun (our choice), a pretzel bun (some people's choice), or no bun at all (WHOSE CHOICE IS THIS???). Brooke Viggiano is a Houston-based writer who would never not choose a bun because that’s crazy talk. Find her other truths @BrookeViggiano.